I started making homemade cottage cheese after reading the ingredient list on a carton from the grocery store. Things like “lactose, salt, guar gum, mono and diglycerides, xanthan gum and carob bean gum.” Why so complicated? 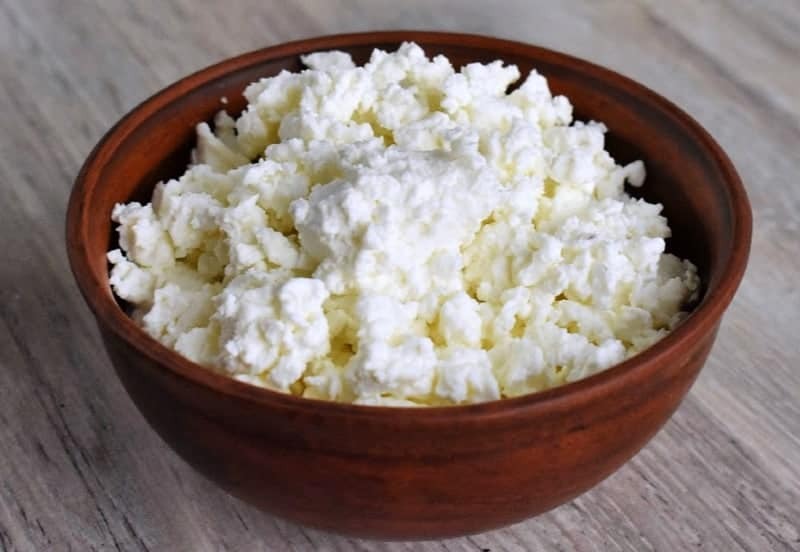 Homemade cottage cheese takes just three ordinary kitchen ingredients: milk, vinegar, and salt. It’s also a fantastic way to use extra milk before it goes bad. Of course, what we call cottage cheese existed before Miss Leslie’s writings. The ancient Mesopotamians were known to enjoy a salty, sour cheese as far back as 3000 BCE. According to legend, a traveler carrying milk in his saddlebags discovered that his camel’s steps and the desert heat produced curds that he enjoyed sprinkled with salt. There’s no proof that this tale is true, though it’s possible that early food storage methods (including the use of treated animal stomachs) might have led to the first cheeses. The stomachs of ruminants, like sheep or goats, contain rennet — an essential ingredient in cheesemaking. For years, I was under the impression that you need raw, unpasteurized milk to make cheese. The US FDA bans the interstate sale or transport of raw milk, and most states have similar laws, too. Then one year, a friend who knows I’m into making things from scratch gave me a book on cheesemaking. That’s when I learned you can make pretty much any cheese from storebought milk, so long as it’s not been through the ultra-high temperature (UHT) process that’s known as “long life milk” in the UK. Unfortunately, most organic milk sold in the U.S. has been through that treatment, so if you’re going to get into real cheesemaking, be sure to check the label. Although my entire family loved the Cotswold Cheese I made a couple of years ago; it took months to age. Unlike firmer or pressed cheese, homemade cottage cheese takes just minutes, and you can eat it that very same day. If you use milk that’s about to turn sour, you’ll want to eat your homemade cottage cheese the same day. Otherwise, it can keep fresh in the refrigerator for up to a week. 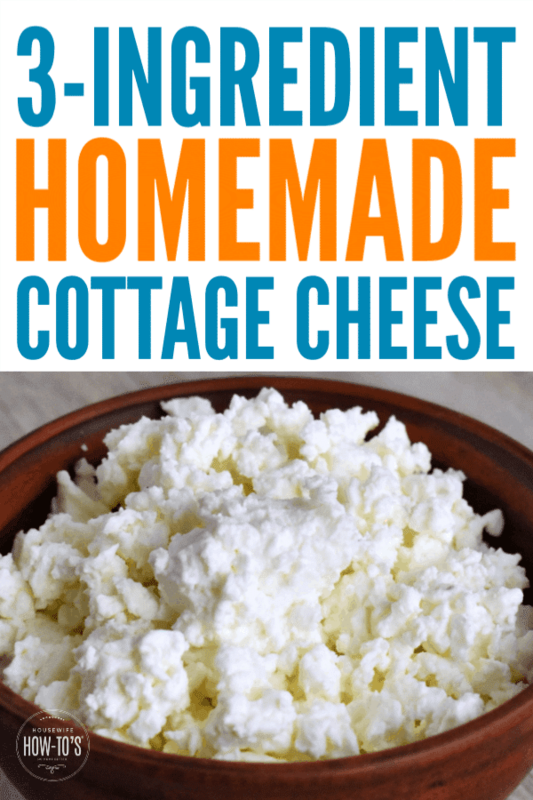 One thing you’ll notice while making this Homemade Cottage Cheese recipe is that there’s a lot of liquid coming out of the curds when you drain them. That stuff is known as whey, and it’s same the yellowish liquid that pools on your store-bought cottage cheese, sour cream or yogurt. Keep it, because whey is a protein powerhouse! Use whey in place of some of the water when you make stock from kitchen scraps, replace part of the water when making baked goods, toss it into soups, or add it to smoothies. I’ve also read that whey makes an incredible beauty treatment. Just pour it on and let it sit for an hour before shampooing to restore shine and make your hair stronger. For feet, add it to a footbath and soak to soften rough heels. Ready to make cottage cheese on your own? Grab a gallon of milk, some white vinegar, and your salt shaker, then let’s get started! Creamy, all-natural homemade cottage cheese is an excellent way to use leftover milk. 1 gallon whole milk NOT ultra-high temperature processed or "long life"
Pour milk into a large, heavy-bottomed pot. Heat slowly to 190°F/88°C stirring regularly so the milk doesn't burn on the bottom of the pot. Remove from heat, pour in vinegar and stir a few times. Cover and let rest for 30 minutes. Meanwhile, line a colander with a clean piece of doubled cheesecloth or a tea towel. Place the colander over another bowl to catch any liquid (whey) that drips out. Spoon the solids from the pot into the lined colander. Let drain for 30 minutes. Gather the ends of the cloth tightly together and form a cloth-wrapped ball of cheese. Holding this in one hand, run cold water over the ball, kneading and squeezing it with your other hand until the entire ball of cheese is cool. 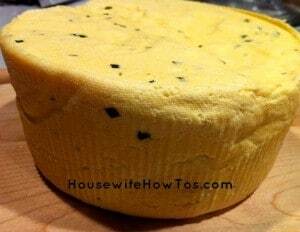 Dump the cheese out of the cloth into a bowl and use a spoon to break it into small curds. Stir in salt to taste. For creamy cottage cheese, stir in the heavy cream 2 tablespoons at a time until it reaches the desired consistency. Check taste and add more salt if needed. Chill for at least 1 hour then stir before serving. Don't discard the whey -- it's packed with protein. Save it in the refrigerator or freeze it for use in soups, stews, and smoothies. You can also use it in place of water when baking bread or desserts. Or pour it over your hair for a deep-conditioning treatment. Homemade cottage cheese is, of course, delicious on its own or topped with fruit. Or go savory by stirring in chopped tomatoes and red onions then seasoning it with cracked black pepper. Turn it into a dip with a little homemade Ranch dressing mix, or use it in place of ricotta when making lasagne. 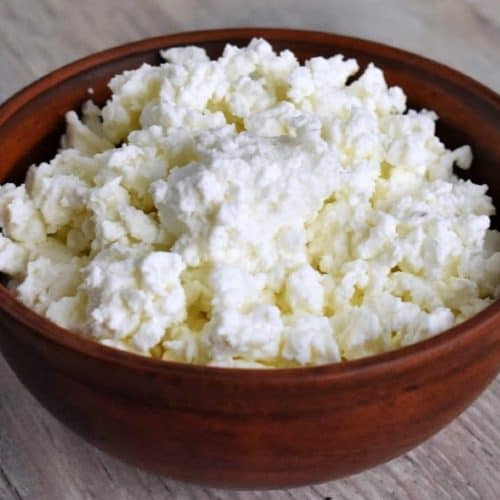 Any way you use it, homemade cottage cheese is delicious! I made this today, started small with 1/2 gallon of whole milk – pasteurized but not ultra pasteurized – and added only a pinch of salt at the end. It came out really good with a mild, creamy flavor and a soft/crumbly feel in the mouth. I’m so glad you liked it! It’s one of my favorite ways to use up extra milk. How much cottage cheese do you get from one gallon of milk? How much whey? When I made it a long time ago I got very little cheese and it was tough/chewy/funny feeling in mouth. Can you think what I might have done wrong? I don’t remember but have been afraid to try again. As the recipe card states, you get 2 cups of cottage cheese out of it. How much whey varies, though, so I can’t answer that one. If it feels chewy, the problem may be cooking it too long or at too high of heat. Made this today using 1 gallon raw goat’s milk. I used the 1 teaspoon of salt and added another cup of whole milk (from the top, so a little extra cream) to the result. It’s cooling now but what I tasted is delicious! My yield is just over 4 cups. A very easy recipe and I will use it again. Thank you! I’m glad you liked it, Debby. I think I’ll make more this weekend, too! Can I use pure cow’s milk? Yes, but if you do then skip the cream. Hey, Katie! Just found you on pinterest. I live in Italy and get raw milk. A lovely layer of cream forms on our milk and because I buy it five liters at a time (every week) I want to find new uses for it. I saw your post and am curious if I can use just a liter of my raw milk since I don’t want to mix store bought cream and skim milk with my “straight from the cow, a quick zap to kill immediate bacteria, and into the sterilized jug” milk. I break mine up into individual liters as soon as I pick it up too. If I’m doing the math I should get about a cup of cottage cheese, right? I eat it on my salads almost daily and I hate having to go to the store for just that. Will this work with UHT milk? That is all I can get where we live. It will work, but you’ll only get small curds. This sounds great! How much cottage cheese does this make?